Since 1991, our websites and publications have become a trusted resource for millions of people. They have also become an outstanding resource for premium brands seeking a highly motivated, targeted audience of people living with diabetes. We currently offer advertising in our diabetes-related publications, including Diabetic Gourmet Magazine, The Diabetic News, The Diabetic Newsletter, and the Daily Diabetic Recipe. Our audience includes Type 1 and 2 diabetics and their caregivers, and women account for 80% of our readers. For an in-depth look at the promotional opportunities available, check out our Online Media Kit or visit the links below. You’ll learn about all the advertising products we offer, including specifications, rates and special promotional offers. The process of designing a campaign and/or placing your advertising with us is an easy process. Over the past 2 decades, we have worked with most major agencies, ad formats, and ad delivery services/systems. So, don’t worry about whether or not we can accomodate your banner advertising or ad tags. 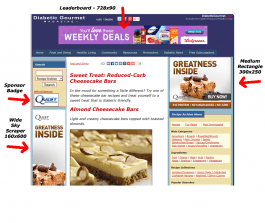 Targeted opt-in email advertising in email newsletters and dispatches such as The Diabetic News, The Diabetic Newsletter, and The Daily Diabetic Recipe. Curious about some of the clients we’ve worked with? Check out our partial client list. Want to see our current lineup of ad products? Look at our Advertising Media Kit. Whether you are representing a large company looking for large-scale sponsorship opportunities, an ad agency looking for cost-effective online advertising for a client, or a small business owner promoting your own website, the marketing opportunities we offer can accommodate budgets of almost any size. Questions? Comments? Contact us.